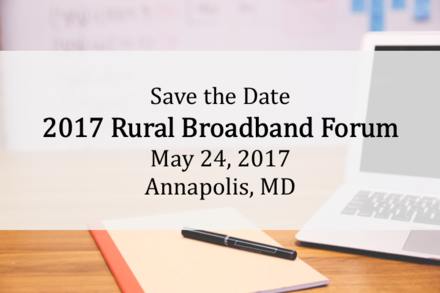 Join the Rural Maryland Council and USDA Rural Development on Wednesday, May 24, 2017 at the Calvert House in Annapolis, MD for a forum dedicated to broadband service in our region’s rural communities. 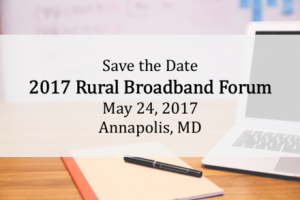 Connect with other stakeholders interested in broadband access and discuss ways to maximize available funding for rural broadband initiatives. Enjoy anticipated breakout sessions on the latest broadband technologies, funding for broadband infrastructure projects, making your community attractive to providers, and using public-private partnerships for broadband development. Registration is now closed. Please call 410.841.5772 to register. Interested in sponsoring or exhibiting? Contact Charlotte Davis at charlotte.davis@maryland.gov. Have a general question? Contact Shannon Reed at shannon.reed1@de.usda.gov.